When I first arrived on the island of Ko Lipe, located in the Andaman Sea in the South of Thailand, I was a bit overwhelmed by the amount of tourists on this small island, especially after just coming from the quiet island of Koh Mook. Arriving on the 30th of December, this was also the busiest time of the year for Koh Lipe. 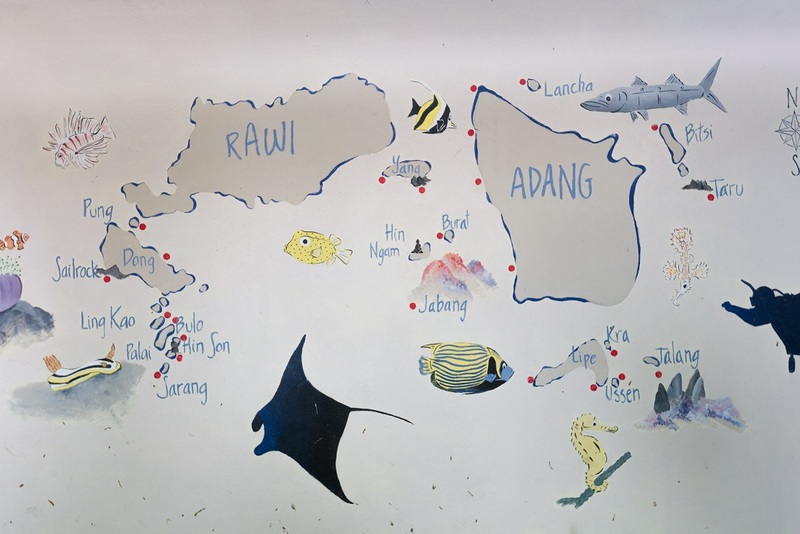 Looking at the size of the island and the amount of tourists, I was very pleased to have my stay booked in the Eco Lodge of Adang Sea Divers. In contradiction to most other accommodations on Ko Lipe, this eco lodge is situated just out of town with some trees and nature surrounding the bungalows and rooms. The eco accommodation has been built in an ecological responsible way, and surprisingly there are only a couple of other accommodations on Koh Lipe which have been built in the same way. Next to being situated in a quiet part of the island with Sunrise Beach at your footsteps, I totally love their concept. Shower water is been recovered to water their plants and toilet water is being filtered in a special way to eliminate bacteria before it reaches the groundwater again. Being aware of the problems of waste and plastic on the small island, Adang Sea Divers & Eco Lodge provides their guests with a stainless steel water bottle which can be refilled with drinking water for free. 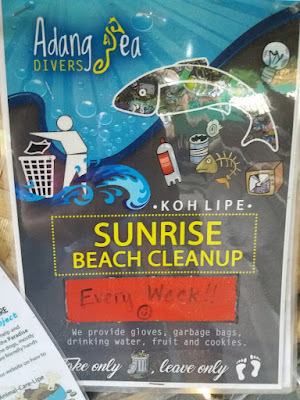 Also, they organise weekly beach clean ups and are involved with other projects to keep Ko Lipe clean. 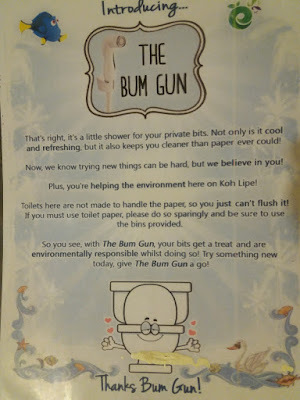 Used in a funny way, they encourage people to use the ´Bum Gun´ to reduce the use of toilet paper. 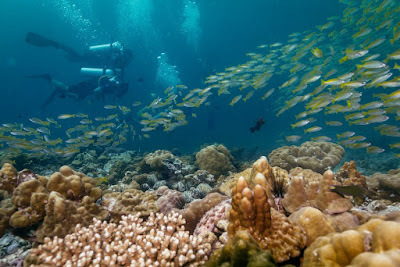 Adang Sea Divers offers 4 dives a day in the high season and you can book each dive separately and just pick your time. 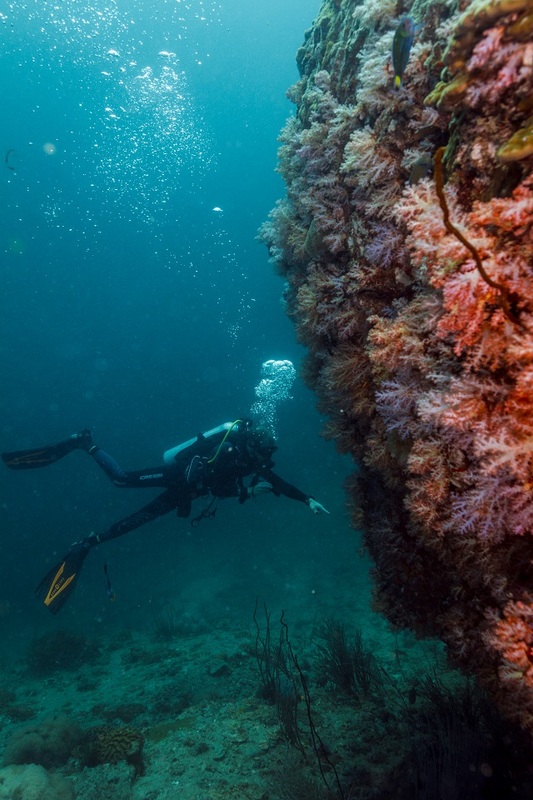 Book your diving a bit in advance over the high season around Christmas as they can be very busy. But even though it must have been one of the busiest days of the year for Adang Sea Divers when I was there, everything was very well organised and the diving took places in small groups. I was on a Thai long tail boat with only one other couple and our dive guide! Because the sea conditions weren´t optimal, probably due to the giant super moon on 1 January 2018, we couldn´t go to the dive sites situated around the almost 20 islands you can find around Koh Lipe. However, they still could take us diving around Koh Lipe, so we went to dive Pattaya Corner that day. After a thorough dive briefing of the dive site in the dive centre we were provided by fruits and biscuits in the 5 minutes we needed to wait for our ´taxi´. We went by tuk-tuk to the beach where our dive boat and equipment already awaited us. After a short boat ride we jumped into the water of Pattaya Corner dive site. 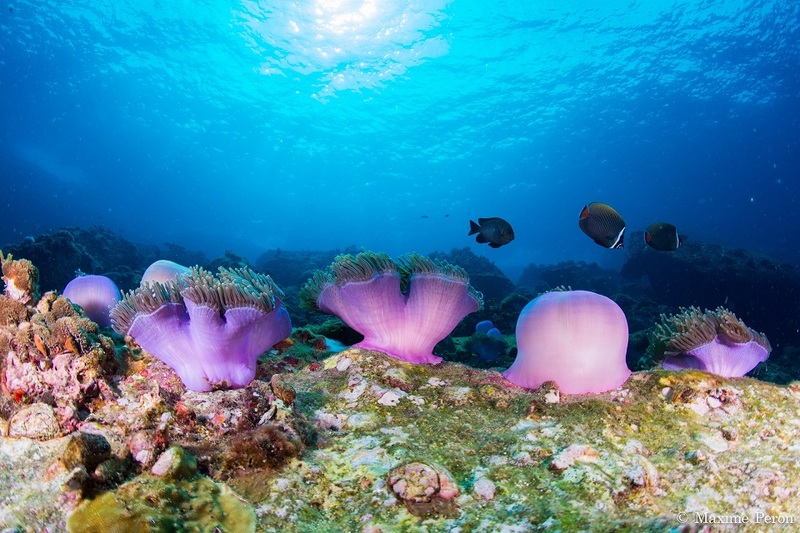 The dive spot was completely covered by pink and purple like Hemprich´s soft coral among other types, it was just beautiful! I was surprised by the amount of fish I saw here, because we were so close to Ko Lipe, but the fish didn´t seem to be bothered by that. Big schools of snappers and surgeonfish as well tiny glassfish were welcoming us when we went down. I was surprised to see my dive computer showing me a water temperature of 28 degrees Celsius which is 2 degrees lower than the waters around Koh Lanta and Phuket. This must be the reason why the corals look so much healthier in this part of Thailand. I guess it´s less affected by global warming and ´El Niño´. At some point a titan triggerfish somehow must have felt treated by us and started to follow us. Out of a sudden it started to quickly come closer to us in rapidly winding movements, before turning around in still a safe distance. It looked like it was trying to warn us: “Don´t come to close me, or even stare at me, or a get you!”. It looked very funny though, because how brave is this little fish if you compare his size to ours! We had a good laugh about it afterwards. We also spotted a moray eel, lionfish, slugs and two nudibranchs making love together (affected by the full moon?) among butterflyfish, angelfish, batfish, anemonefish and pufferfish. Other things to see around Pattaya Corner include octopus, boxfish, porcupinefish, filefish and even the seahorse among much others fish and interesting sea life. I felt satisfied by this dive on the last day of 2017. Adang Sea Divers has a speedboat available to offer you a fast boat trip to the other beautiful dive sites around Koh Lipe. Some of these dive spots within the Tarutao National Park can be reached within 15 minutes. 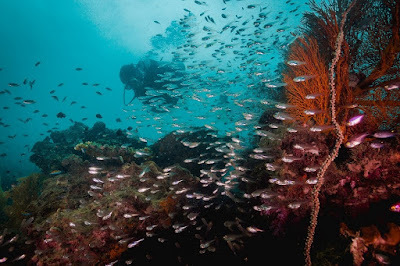 I will name a few of them here, but more information about all dive sites around Ko Lipe can be found here on the website of Adang Sea Divers. Stonehenge is the favourite dive site of the team. 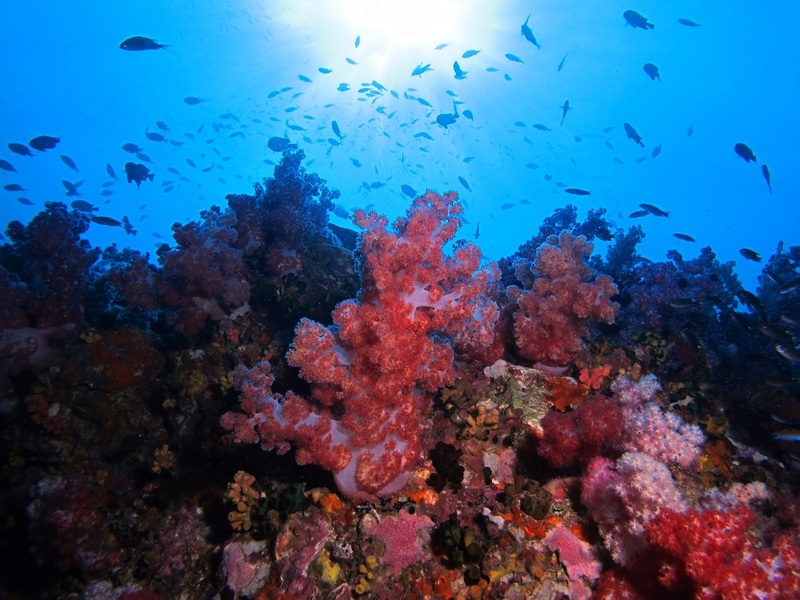 Hard and soft corals here give home to mackerel, tuna, devil rays, seahorse & ghost pipefish among other things. 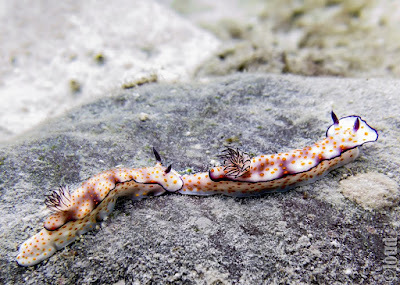 Talang is another favourite and due to the cleaning stations to be found here, also smaller things like nudibranch and shrimps can be spot among scorpionfish, stonefish, stingrays and travellies. 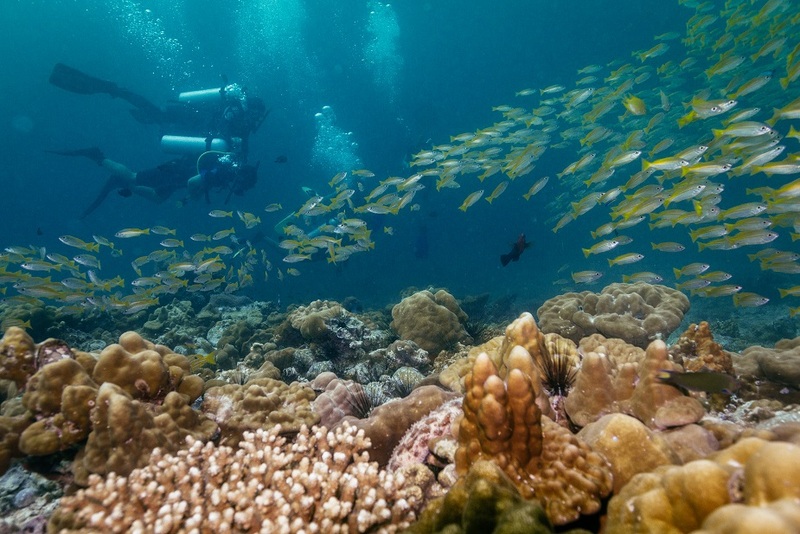 The small island of Koh Taru offers hard corals and the marine life here include Harlequin shrimps, marbled rays among many other fish like named above. 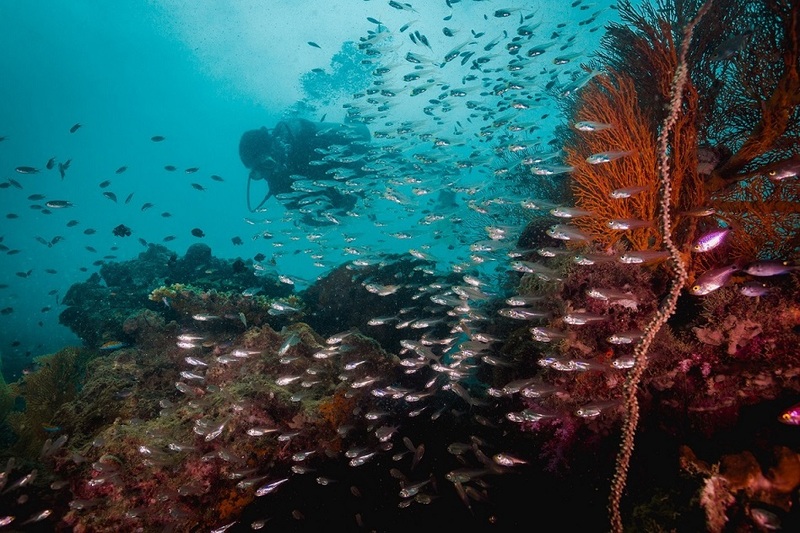 There are also some dive spots a bit further away including the dive sites around Far Islands and Seven Rocks, a place which the dive center has recently discovered. 8 Miles Rock is known for a chance to see bigger fish including the whaleshark but can only booked as a special trip. You can read more here. The waters around Ko Lipe are a paradise for underwater photographers due to the huge amount of macro life among the healthy soft and hard corals. Besides a variety of big schools of fish, reef dwellers like cuttlefish, seahorses and pipefish are frequently found. Larger marine creatures like sea snakes, different types of sharks, rays and turtles can also be encountered. If you´re lucky, you can even see a whaleshark, sailfish or coral cat shark. 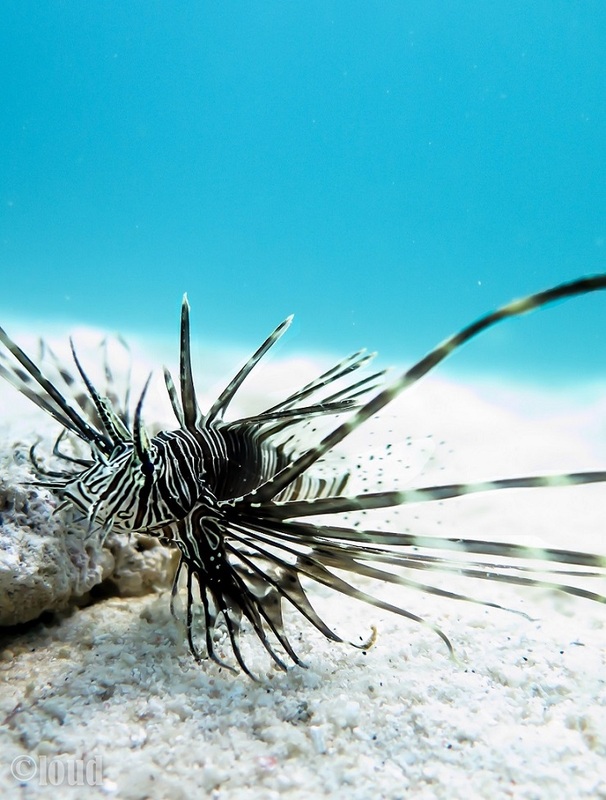 You can read more about the marine life around Koh Lipe by clicking on this link. Free accommodation during the low season!! Unlike many other places in the Andaman Sea, especially the places North of Phuket, scuba diving on Koh Lipe is available all year round. In fact, the ´green season´ from the 15th of May till the 15th of October is considered the favourite dive season by many staff members. The good news is that you´ll get free accommodation in their eco lodge in this season if you do 2 dives a day. Very friendly and professional team..
During my stay all the instructors were very friendly and helpful. The instructors and guides give you a very complete dive briefing and are available for a chat afterwards as well. Most of the staff is there long term so they know the dive sites well and can tell you everything about the marine life around Koh Lipe. Also, there was quiet a lot of staff with a variety of languages spoken. Guided diving is always done in a group of 4 divers max with one guide. I think Adang Sea Divers really makes a difference on Koh Lipe Island. 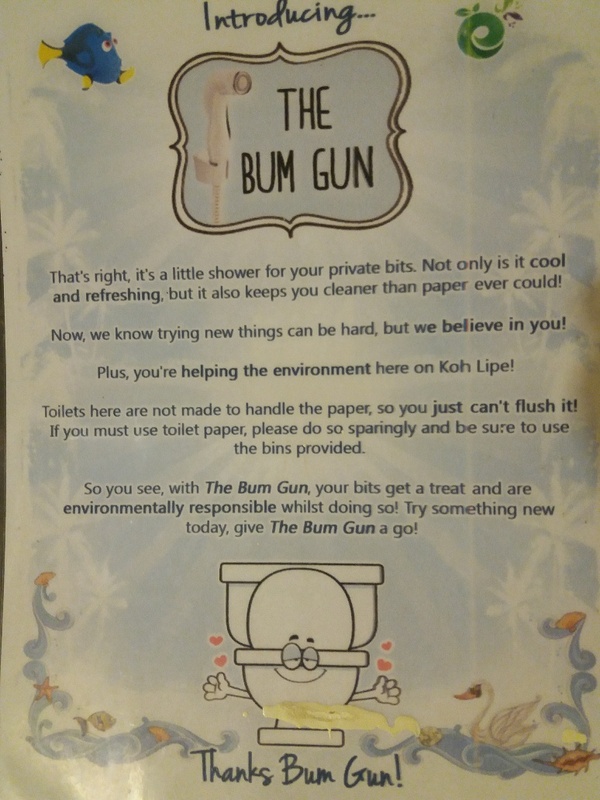 I have been chatting to the owners and I could sense their love for Ko Lipe. With the activities they do, and the way the diving is organised, you´ll notice that their heart is for diving and the oceans and it´s not only about the money like many dive centers nowadays. For me it´s no wonder that this PADI 5 star dive resort is rated number 1 on TripAdvisor. The eco-friendly dive center of Adang Sea Divers is located on Sunrise Beach on Koh Lipe. All PADI courses are available from Discover Scuba and Open Water to Divemaster. High quality Aqualung rental equipment is available, night dives can be organised and if you like to dive with Nitrox, that´s possible too. 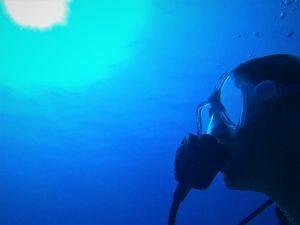 The best dive conditions are usually around half moon, so if you can, try to plan your trip on that. Although the diving will also be good if you come another time. Book your accommodation well in advance if you´re planning to go in the high season. Thank you, Adang Sea Divers!!! First of all, a big thanks for providing with me the photos in this article. But even more for making an eco friendly dive holiday available to all of us and for making such a difference on an island where it´s needed and many others don´t care. How to get to Ko Lipe island? Koh Lipe Island is located in the South of Thailand, not far from Langkawi Island in Malaysia. You can either take a boat from the mainland like Krabi, Trang or Satun. The island of Koh Lipe is also reachable by speedboat from most other islands South of Phuket. If you come from Malaysia, you can take the speedboat from Langkawi Island and get a visa stamp at the small immigration office on Ko Lipe. 12go.asia can book your complete trip to Koh Lipe for you, no matter where you are in Thailand or Malaysia. If you use the search box below, Splashpacker earns a small commission. Thank you for your support! Where to stay on Ko Lipe Island? I can highly recommend to stay in the Eco Lodge of Adang Sea Divers. Like mentioned, they are located in a quiet area and if you´re a diver, you might make some new friends here! Also remember that you support an ecological conscious concept by staying with them. Book well in advance since they can be fully booked. Holiday homes with a bit more comfort like airconditioning and a hot water shower go for about 2200 Baht. Two places I checked out are Lantern Inn which is run by a friendly Thai family and offers free breakfast with their stay and Harmony House Bed & Breakfast, looking a bit more stylish with modern furniture and everything looks pretty new. Accommodation prices can be a bit high on Ko Lipe, especially during the high season. If you´re looking for a budget accommodation and want to stay in a shared room to save on costs, you can stay for about 400 Baht in the Sang Chang Hostel or for about 650 Baht in The Street Hostel or Bloom Cafe & Hostel, among many other options. Most of them offer private rooms too. The cheapest option on Koh Lipe is to go camping with Lipe Camping Zone, from 400 Baht per night for a tent. If you are looking for a luxury dive holiday and don´t mind paying a bit more for your accommodation, I heard a positive feedback from a friend who stayed in the Cast Away Resort and highly enjoyed her stay. Prices start from about 3200 Baht. They´re located on Sunrise Beach, very close to Adang Sea Divers. Please note that all prices mentioned are subject to change and dependent on seasons. You can find up-to-date prices on booking.com and Slashpacker will earn a small commission if you book there, thank you!! Keep an eye for my next article about their partner dive centre Blue View Divers, on Koh Phi Phi Island. This dive centre is also ecological responsible and is highly involved with environmental projects on Ko Phi Phi like plastic recycling, promoting to get locals to dive and do daily clean ups after diving. Blue View Divers have many awards like PADI Green Star Awards and are members in, and support, GreenFins Thailand, Trash Hero, Project Aware, Phi Phi Island Protection and Conservation and are a Shark Guardian Centre. Blue View Divers is owned by the same people as Adang Sea Divers. Other posts you can expect from me are about my adventure of island hopping to 9 islands in the Andaman Sea with personal travel blog updates and articles with travel information. You can also follow me on the Splashpacker Facebook page or Instragram.